No one should have to choose between leaving an abuser and abandoning a beloved pet, yet the staff at Grammy’s House finds too many victims are forced to make this choice. The local domestic violence shelter is therefore pleased to announce the installation of four kennels, ready to house pets who are the forgotten victims and witnesses of abuse. 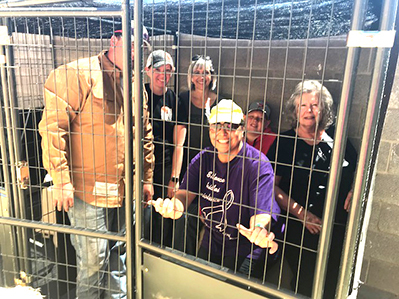 “Thanks to some awesome volunteering angels, we now have full-service kennels, food, shade, etc.,” said Celina Bryant, Grammy’s House executive director. The kennel area is known as Lightening’s Run in honor of a dog that was displaced from its family. Grammy’s House wishes to thank Linda Moreno, Lisa Swint, Pastor Sid Sides, Ruth Ann Calvert, Kevin Curtis, and Janet and Scott Richardson for making the service possible. 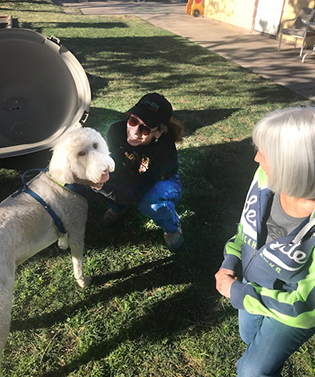 “The staff and board of directors will be forever grateful to these wonderful people who took the time and made the effort to construct these wonderful new homes for our precious four-legged survivors,” Bryant said.